I encountered the world of studio pottery on being appointed to my first job as Assistant Keeper in the Ceramics Department of the V&A in the 1970s. Though a specialist in Islamic art, I was asked if I would be interested to take on the studio pottery as well. Interested indeed I was, and for nearly 25 years I was much involved in it. 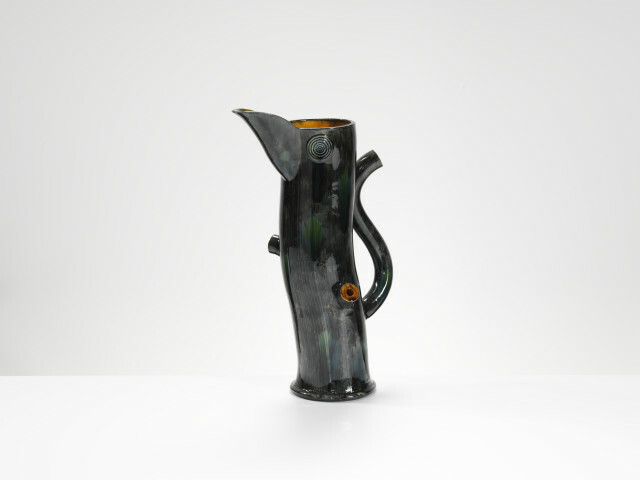 Among the most interesting work then, and among the most interesting, intelligent and amiable of potters, was Wally Keeler. A major debate at that time was whether pottery could or should be an art (a view promoted skilfully by Victor Margrie at the Crafts Council with his disparagingly named “Royal College Girls”) or should remain beautifully functional, following the vision of Bernard Leach and his followers with the promotion of the “ethical pot” (disparagingly termed “the brown mug brigade”). Wally Keeler, wonderfully and refreshingly, showed how this sterile debate could be avoided altogether. He made functional wares - jugs, mugs, teapots - with a craftsman’s skill that could not be faulted by the most extreme of brown-muggers. His aesthetic on the other hand showed a refined modernism - precise, pure shapes, tending to the geometric. Yet the pots were tactile and best appreciated in the handling: crisply made, with luscious dark salt-glazes. We developed together a teaching project which remains one of the most successful the Department ever hosted. Wally and his colleague Mike Hughes came with their students for a week of intensive study of the Museum’s historic collections, and the students were set to respond in their own work. I remember the moment when Wally, with a look of mischievous delighted, said we should perhaps present them with the most challenging material of all - Meissen figures! A later session focussed on Staffordshire industrial ware, an experience still resonant in the brightly coloured Whieldon-type glazes that Wally continues to use. Studio pottery as a whole went through many phases - the rise of the ‘figure’, the advent of post-modernism, the decline of the brown mug, the prettification of design. I eventually lost touch with the field as I left to work in other areas. Returning now, after an absence of some two decades, I was surprised and am delighted to find Wally still at work, still making wares of the same quality and integrity, and still using his imagination and intelligence to answer directly the question of what a studio pot can be. Intelligence, deep thought, and commitment embodied in things of intriguing and satisfying beauty.